a view from the cobblestones: Happy Feast of Saint Joseph! Today is the feast of Saint Joseph, the husband of Mary. 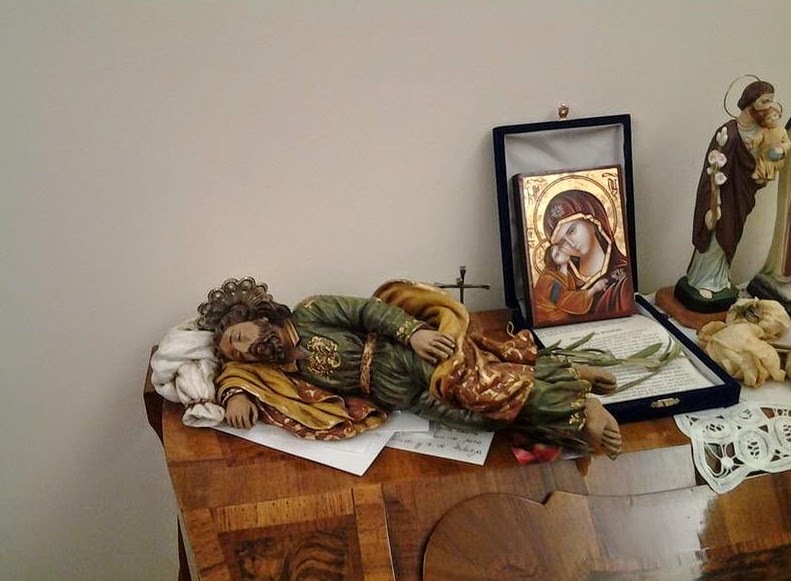 Did you know that Pope Francis has a statue of Saint Joseph on his desk? It’s a pretty unique one too, since it’s Saint Joseph asleep! Take a look at this video from romereports which shows the statue. Pope Francis explains that when you need to ask saint Joseph for help, you should put a little note under his statue. Francis has quite a special relationship with Joseph. Referring to him, he says elsewhere, “You know, you have to be patient with these carpenters: they tell you they’ll have a piece of furniture finished in a couple of weeks and it ends up taking a month even. But they get the job done and they do it well! You just need to be patient…” Reminds me of some carpenters I know! At one point in the video, Pope Francis even speaks a little English! Pretty neat!